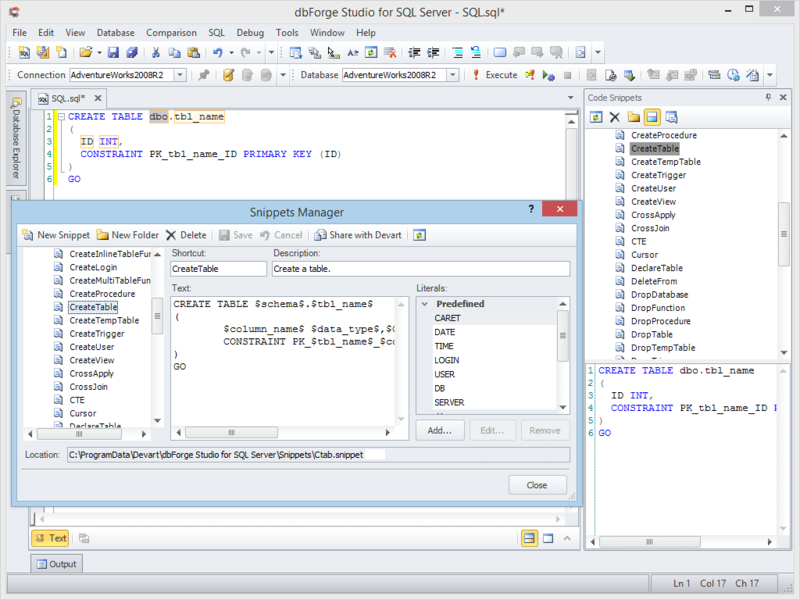 This page provides more information about the SQL Coding Assistance features provided by dbForge Studio for SQL Server. 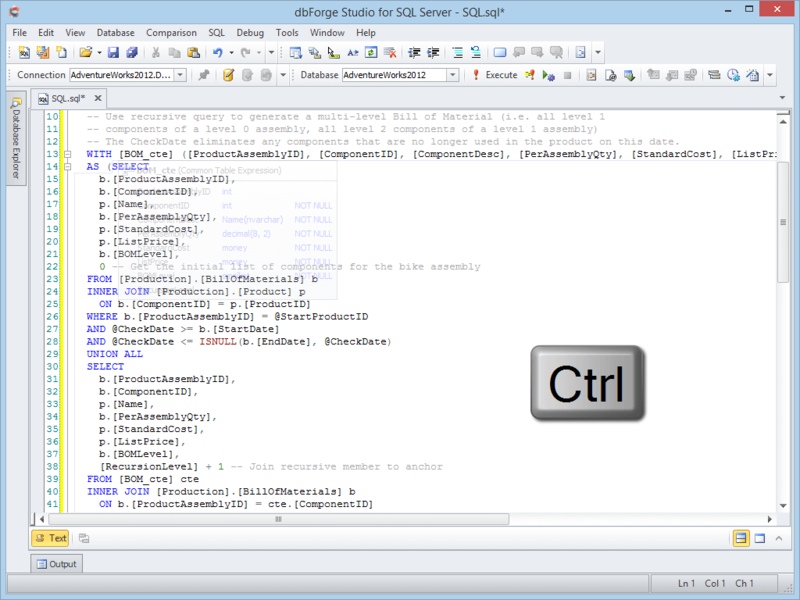 The application suggests object names for use at a certain position of the code. A list of valid members for current object appears when you type the period (.) 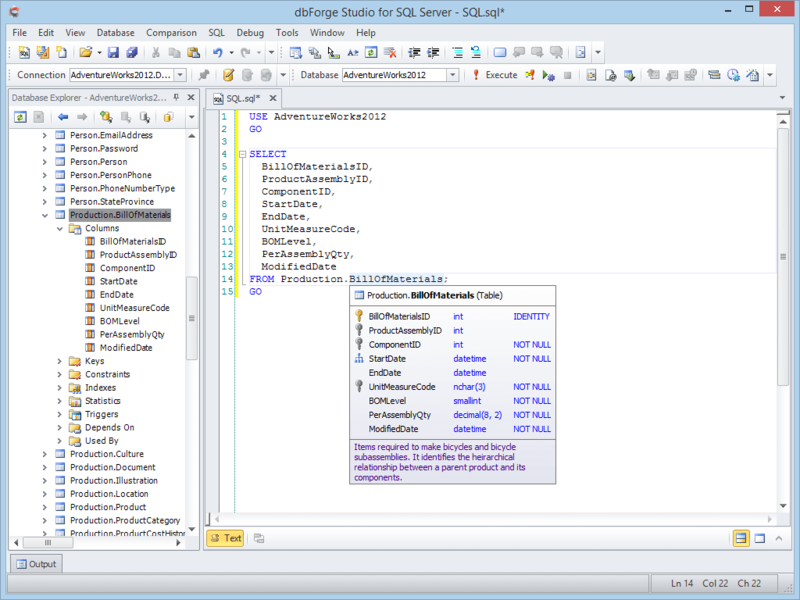 symbol after the object name. 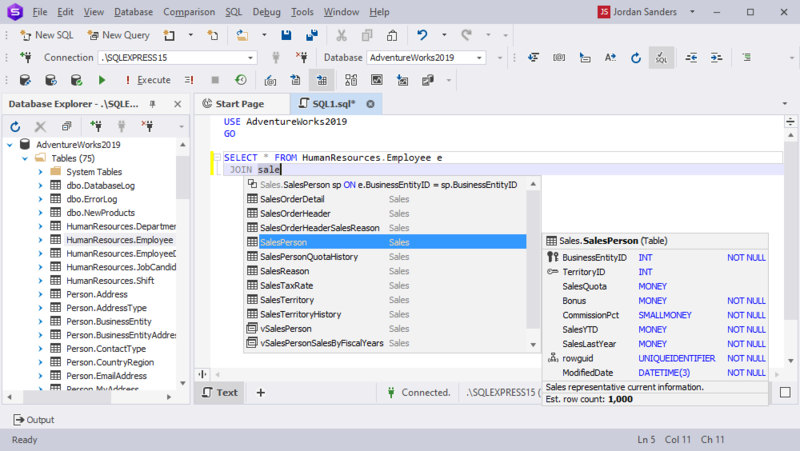 You can select required columns from the prompt list using only the mouse to add them to your SQL query document. 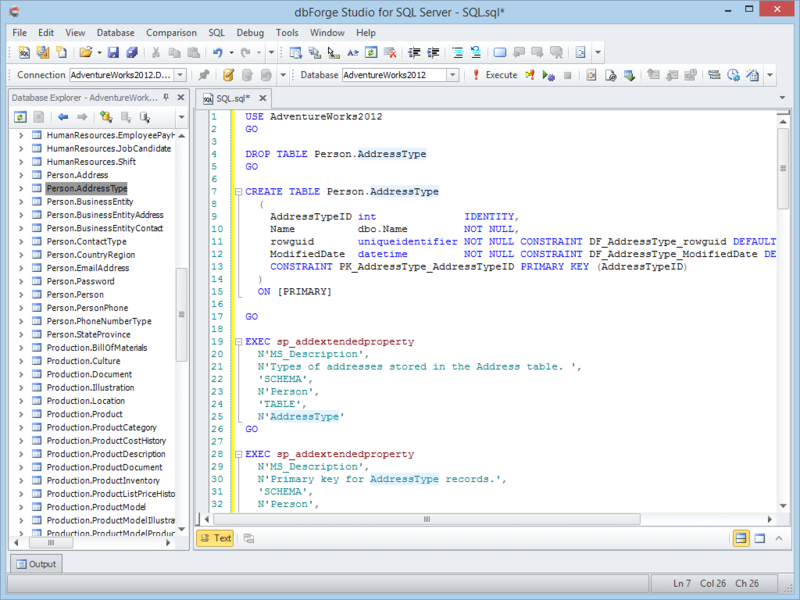 The application suggests a full JOIN clause based on foreign keys, or it can suggests conditions that are based on column names. You can replace the asterisk (*) symbol with the list of columns from the required table or view on pressing the Tab key. Once you have entered an object name, the application automatically generates an alias for it in the FROM list of your SQL document. You can type available table names, views, procedures, functions or triggers in ALTER, INSERT, EXEC statement and expand the statement to the full template by pressing the Tab key. The application recognizes what you are typing, and converts the keywords to uppercase letters, in case you are writing in lowercase. 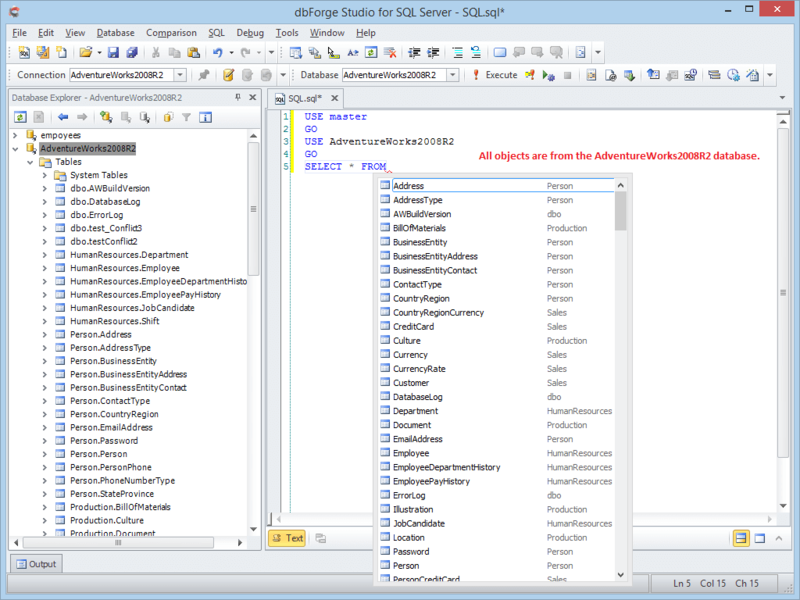 The application analyzes the context in order to predict what you may type next, and displays only relative keywords and names of database objects. 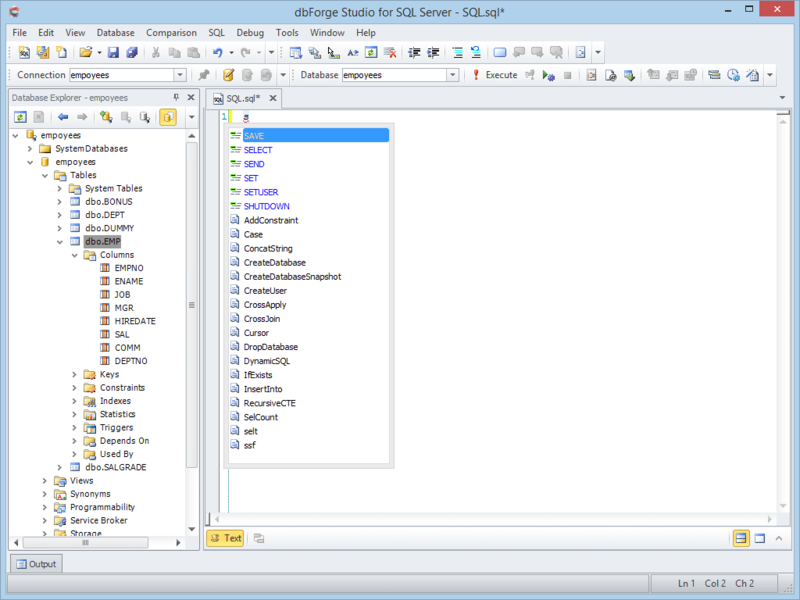 The application displays the list of database objects from the current database or schema. The application filters names of objects and keywords in the list automatically based on what you are typing, and suggests relative ones. You can hold Ctrl to make the suggestion box switch to semi-transparent view to look through it without closing. 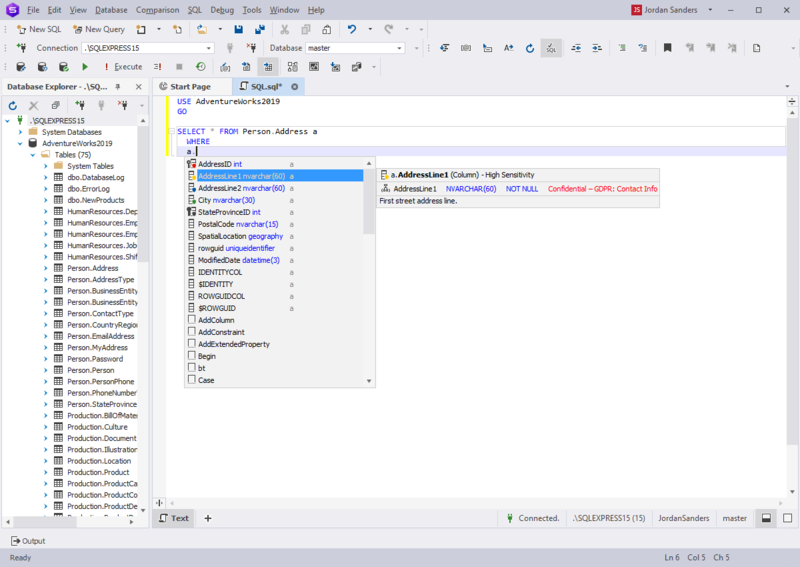 Hover the screen cursor over a database object to see its details. The application also displays a hint with information about the function and its parameters when you call any built-in or user-defined function in a query. 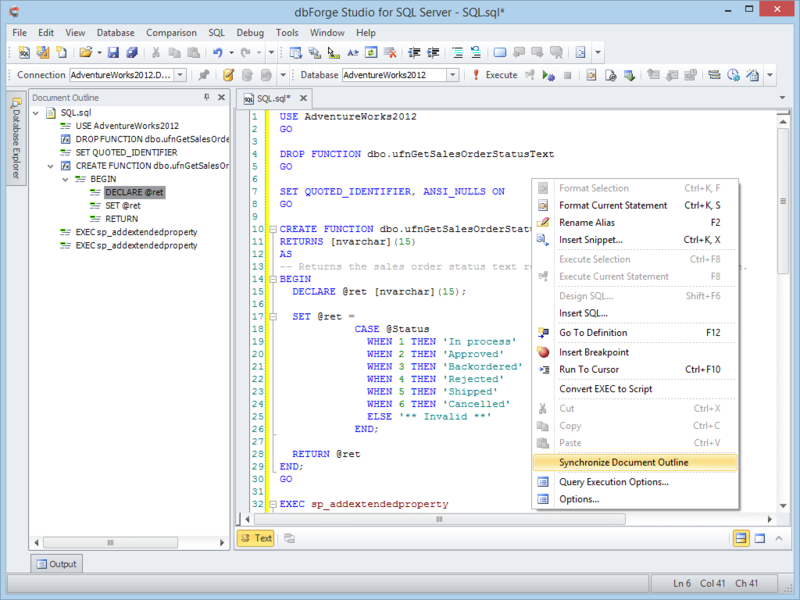 The Document Outline window displays the logical structure of currently opened SQL document, and allows you to view and navigate statements in SQL documents. 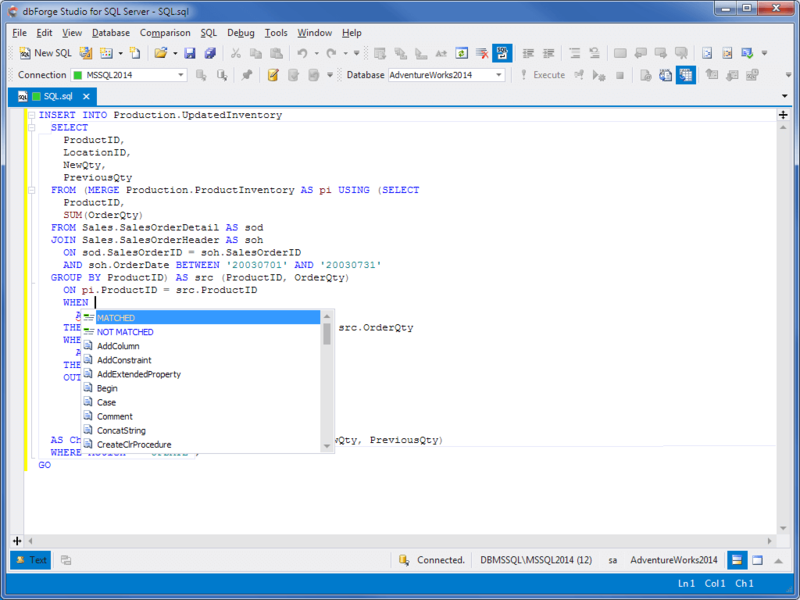 This option allows you to open Visual Object Editor and explore DDL objects with their properties. You can hover the screen cursor over an identifier to see all its occurrences in the text. 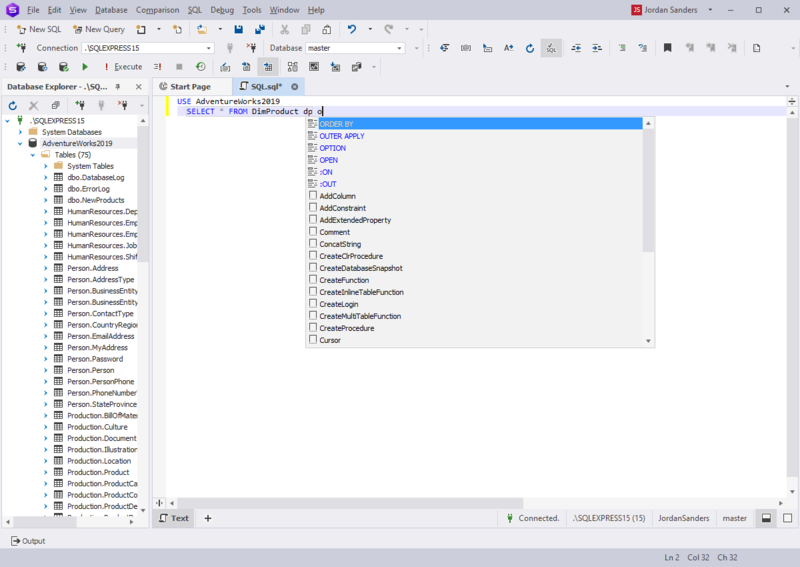 The application suggests not only separate keywords and object names, but entire code phrases. For instance, OUTER APPLY instead of APPLY, and ORDER BY instead of ORDER are prompted in the SELECT query. For a complete list of supported phrases, see product documentation. 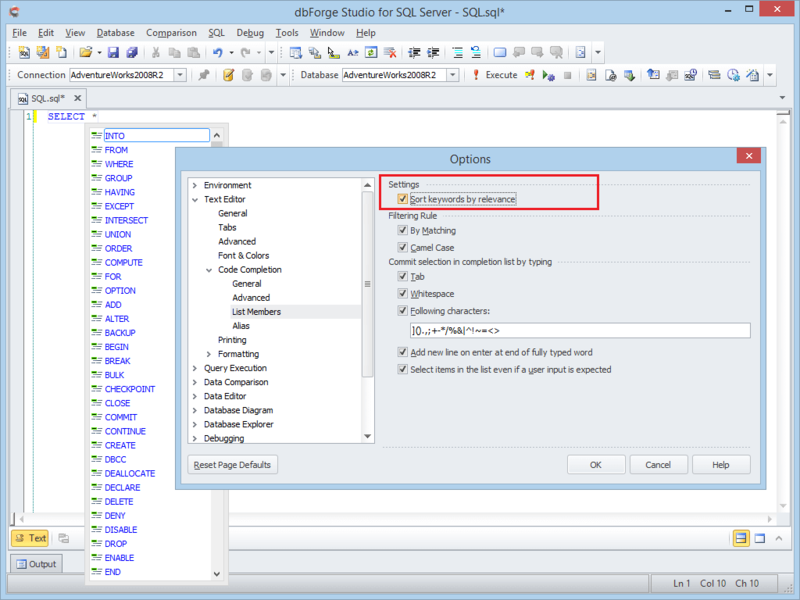 The prompt suggests clauses of the MERGE statement, that determine whether to update or insert into the target table or view.